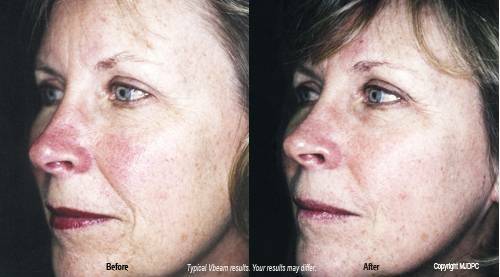 Vbeam laser treatment improves age spots, rosacea and discolorations for the healthier skin you want. Nothing is quite as beautiful as soft, smooth, healthy-looking skin. Advanced laser treatments are performed by Dr. Petrin for patients from Redmond, Kirkland and Bellevue, using the Vbeam® laser to safely, easily, and effectively treat many skin disorders painlessly, including vascular lesions, spider veins, and angiomas, on an out-patient basis. The word LASER is an acronym for Light Amplification by the Stimulated Emission of Radiation. The Vbeam uses an intense beam of light, delivered in long pulses, to help our physician gently remove unwanted, damaged, or diseased cells without harming the surrounding healthy cells. Skin blemishes due to abnormal blood vessels located directly under your skin's surface that give the skin a red color are called vascular lesions. Port Wine stains, strawberry hemangiomas and spider veins (telangiectasias) are all forms of vascular lesions. What type of lesions can be treated with the Vbeam laser? Are Vbeam laser treatments safe? Do Vbeam treatments for skin lesions hurt? How many Vbeam treatments are required? This depends on the size, location, depth and color of your lesion. Spider veins on the face and age spots generally do well with 1 - 2 treatments, while darker or deeper birthmarks may require additional treatments. Treatments should be placed several weeks apart to allow your body to remove the maximum amount of pigment cells. You will continue to see a lightening of your lesion after each treatment as your body disposes of the pigment cells. What results can be expected from Vbeam? After Dr. Petrin performs Vbeam laser treatments, most patients will see improvement in their vascular and pigmented lesions. The improvement can be quite dramatic. However, as with any surgical procedure, there is always a possibility that only minor changes will occur and in rare cases there is no response.